Qin Shuyang was graduated from Huazhong University of Science and Technology. He has been working in the home appliance industry for more than 10 years, responsible for developing plastic materials and their innovative applications, optimizing purchasing platform, promoting new materials across the supply chain, etc. He was in charge of some award winning technology projects within Midea Group. Si Lifeng worked for the China Household Electrical Appliances Research Institute from Aug 1996 until September 2007. He has worked for the China Quality Certification Center since September 2007. Zhu Changchang is a professor level senior engineer. He studied in the US during the 1980s, and has been focusing on the research of electro-optical display technology. His working experiences include: Deputy Chief Engineer, TCL Industrial Research Institute; Deputy Chief Engineer, Nanjing Research Institute of Electronic Device of China Electronics Technology Group Corporation; Chief Engineer, China Flat Panel Display Engineering Technology Research Center. Zhu Changchang was also the Vice Chairman of both China Optics and Optoelectronics Manufacturers Association Liquid Crystal Branch and SID Beijing Branch. He received the second class award of The State Science and Technology Prizes in 1985, and the second class award of The Science and Technology of National Defense Prizes in 2004. Dr. Qiu Yaohong was graduated from National Taiwan University of Science and Technology. He is a consultant of China and Taiwan MIM industry, and published over 20 technical articles. Wang Changming, Senior Engineer, R&D Director, JANUS (Dongguan) Precision Components Co., Ltd.
Wang Changming was graduated from Wuhan University, majoring in polymer chemistry. He received his Master of Science at East China University of Science and Technology. He holds various positions in different national standardization committees. He has over 20 years of working experience in new materials, molds, materials, surface treatment, additive manufacturing and smart manufacturing. Marco Zhong has been working in the safety testing of food contact materials for 20 years. He has been participating in the negotiations and technology exchanges between China and international organizations such as US FDA. Gence Shi, Director, Lenovo Research, Lenovo (Shenzhen) Electronic Co., Ltd.
Gence has 20 years of experience in research and developing consumer electronics. He was in charge of the HTC Magic Lab and led the team to successfully develop HTC TOUCH in 2007. He has applied for around 100 patents personally. With rich experience in product development (PC/smart phones/ wearables/ IOT/ Robot), he has deep understanding of the market and technology trends. Tony Xue, Product Marketing Director, Wingtech Mobile Communications Co., Ltd.
Tony Xue was born in 1982. He received his Master's degree in Shanghai Jiao Tong University. He has 13 years of experience in development and product planning of mobile phones, and was involved in the planning of many popular smartphone products. Guowei Zhang, Engineer, Supervisor Materials, Joyoung Co., Ltd.
Guowei Zhang was graduated from Harbin University of Science And Technology, majoring in material science. After his graduation, he worked in the PVC stabilizer, WPC material and modified plastics sectors. He joined Joyoung Co., Ltd. in 2007, and is now responsible for the materials standardization and safety management of the company. Bob Su, Founder & CEO, Shenzhen Augmented Reality Technologies Co., Ltd.
Bob Su was the Senior VP of Beijing Crystal Technology Training Ltd. He is an expert in AR/VR research and development, and owns over 10 related patents. He was in charge of the first Chinese AR binoculars which are used for inspection and production purposes by STATE GRID Corporation of China, Huawei, Siemens, Jiangling Motors, etc. Mingfu Huang, General Manager, Shenzhen Samy Design Research Ltd.
Mr. Chung joined the Chen Hsong Group in 2001 and was appointed a Director of the Company in 2003. He also holds the position of Group Chief Officer – Strategy, Sales and Marketing. Mr. Chung holds directorships in certain subsidiaries of the Company. Mr. Chung holds a bachelor degree of Science in Electrical Engineering & Computer Science from the University of California, Berkeley. He also holds an MBA degree in Finance from Columbia University, New York City, U.S.A.. Prior to joining the Chen Hsong Group, Mr. Chung had more than 14 years’ experience in sales and marketing, management consultancy, financial analysis and information technology. Keanu, Sales Director, Jinyoung (Xiamen) Advanced Materials Technology Co., Ltd. Started as a R&D researcher and successfully transferred to Sales and Marketing position of Jinyoung Advance Material LLC, Du ZhiYun has engaged in advanced material industry for almost 20 years. Equipped with comprehensive capabilities in product marketing, market expansion, supply chain management and team leadership, Du ZhiYun is acting as the Sales Director. Christy Yu, bachelor from East China University of Science and Technology, currently Customer Development Engineer in Specialty Polymers, supporting Santoprene TPV. Xianzhe Xu, Technical Supporting Supervisor, Shanghai-Fanuc Robotics Co., Ltd. Graduated from Nankai University, Mr. Xu has over ten years experience in injection molding application field. He is adept at operator training, new technology development and molding technical supporting. Heinz-Christian Krempels, Technical Manager Pigments & TiO2 Specialties, Commercial Development, KRONOS International Inc.
Christian Krempels is Technical Marketing Manager in the Commercial Development Team of KRONOS, developing the pigment and specialties business at KRONOS International Inc. He has over 30 years of extensive experience in operation, service and research in the chemical industry which facilitates the understanding of customer applications he supports in different countries and cultures. Half of this professional life he has spent in the TiO2 business in technical sales support positions and as manager of application technology labs. Christian Krempels master graduated in Chemical Engineering and Business Administration. He holds a PhD in Polymer Chemistry from the University of Stuttgart. Tony Song, Sales Director, RADICI Plastics (Suzhou) Co., Ltd.
Tony Song is a new member for Radici Suzhou as a sales director since Mar.2017, with 17 years' experience for engineering plastics, will be focusing on Non-auto market e.g. E/E in China. Thoenniss was born in 1959 close to the German City of Düsseldorf. After graduation from school, he served for 12 years as a technical officer and company leader in the German Airforce. During his military time, Thoenniss received a master degree in aerospace engineering from the University of the German Armed Forces in Munich. Later he joined the world leading power transmission manufacturer Flender, today owned by Siemens, and held several managerial positions in technical service, quality management and sales & marketing in Germany and in the USA. In 2001, Thoenniss joined the Brueckner Group and was managing director of one of its lead divisions until the end of 2015. Beginning of 2016, Thoenniss became the CEO of Brueckner Technology (Suzhou) Co. Ltd, a Brueckner Group platform company in China, representing Kiefel and the other Group divisions in the Chinese market. Kiefel serves its market in China through a skilled local team of sales and service specialists. Dr. Jonson Xing has been responsible for the development of engineering plastic materials in consumer electronic goods and electrical equipment in Solvay Engineering Plastics since 2013, with the focus flame retardant and metal replacement solutions for home appliances and electrical products. In the past 7 years, he was working in Solvay Korea and Shanghai R&I center, leading the lab team dedicated to performance polyamide research and innovation, especially the development of new flame retardant materials. Kevin Wang, Sales Director, Engel Machinery (Changzhou) Co., Ltd.
Kevin Wang, the sales director of ENGEL Machinery (Changzhou) Co., Ltd., is responsible for sales and promotion of WINTEC, which is the sub-brand of ENGEL. He has been engaged in injection molding machine industry for more than ten years and has a deep understanding of plastic molding industry development and market demand, while grasping the market development path and planning clearly. Yuanbo Zhang, Manager, Welltec Machinery Ltd. Manager of Technology Application of Welltec Machinery Ltd., specialized in providing professional individual solution and technical support for customer. As an expert in horizontal injection moulding machine for 11 years, he has an extensive and profound working experience in injection moulding machine manufacturing industry and manufacturing plant. And has a wide range of knowledge and technology in the following areas: design of the whole series, marketing technical support, maintenance technical support and training, customer application support, establishment of assembly line, etc. In addition, has a rich engineering and technical team management experience. 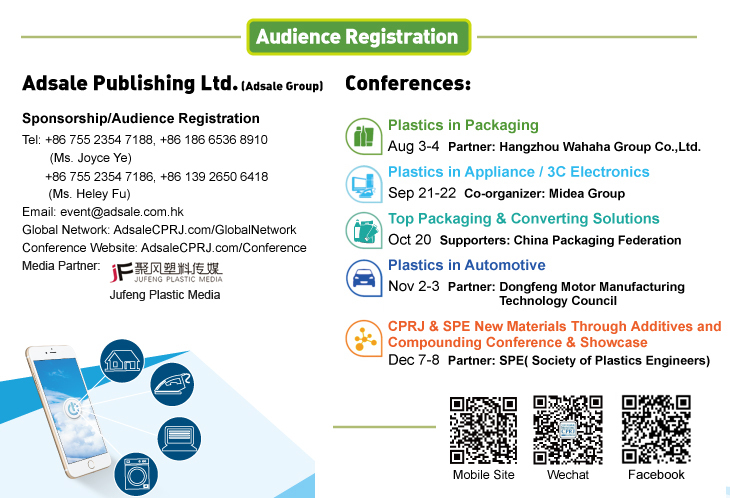 More invited speakers, Please visit www.adsalecprj.com/3CConference! MULTITECH MACHINERY (SHENZHEN) CO., LTD.
SUZHOU KONIG TECHNOLOGY CO., LTD.
FRENK HOT RUNNER TECHNOLOGY CO., LTD.
ZHONGSHAN DOLEUNGCHOI PLASTIC TECHNOLOGY CO., LTD.
HOSTAR HOT RUNNER TECHNOLOGY CO., LTD.